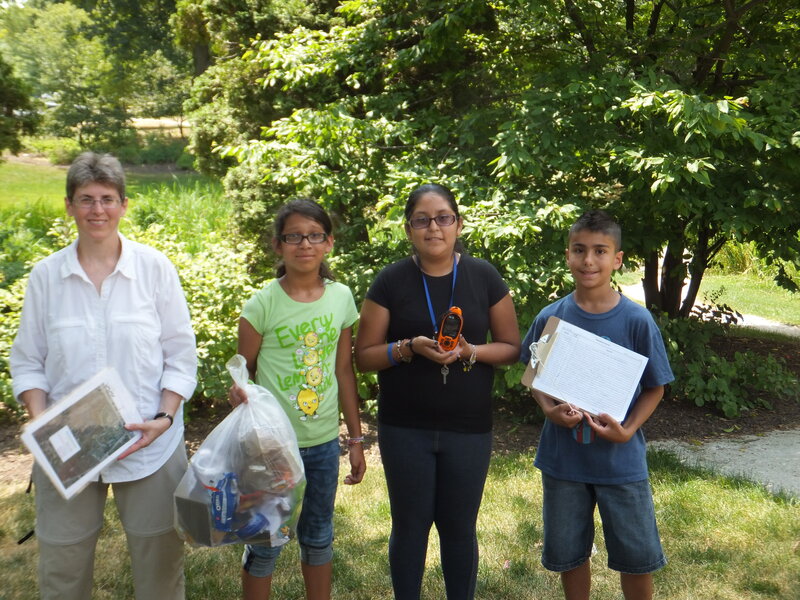 During the summer of 2012, the Geographic Society of Chicago (GSC) had the opportunity to work with Cool Summer Experience (CSE) students sponsored by the First Baptist Church in Waukegan. Our goal was to involve students in identifying and solving a community problem using geospatial technology. Their specific charge was to identify and map the locations of litter in a community park. Over the course of three weeks, our team of geographers worked with 60 students in small groups. They were first trained in using handheld Global Positioning Systems (GPS) units. Then each group walked a different route through Bowen Park. Along their routes, they collected litter, recorded the locations on their GPS units, and noted the number of items and the type of litter on spreadsheets. Upon return, each team weighed their garbage bags and observed the relative volume of all the bags. Students then uploaded their data to a computer and viewed their routes and the locations where garbage was found. Students later met in a computer lab to work with the field data in Geographic Information Systems (GIS) software. Creating map layers of each team’s results, students manipulated these layers to draw conclusions about the distribution of garbage in the park in relation to the present locations of garbage cans. Students wrote up their results, conclusions and recommendations for how trash could be handled better. One student commented that, “Bowen Park didn’t need more garbage cans. They just needed them in different places.” Their articles were published in the Eco Times, the CSE newsletter, under the title 21st Century Technology Comes to CSE! Several weeks later, Susie Schreiber of the Waukegan Harbor Citizens’ Advisory Group (CAG) and the Illinois Audubon Society contacted the GSC to accompany her and some of the CSE students on a boat expedition to map swallows’ nests in Waukegan Harbor. The U.S. Environmental Protection Agency is funding a project to dredge PCB-laden sediments from the harbor as part of its superfund cleanup program. 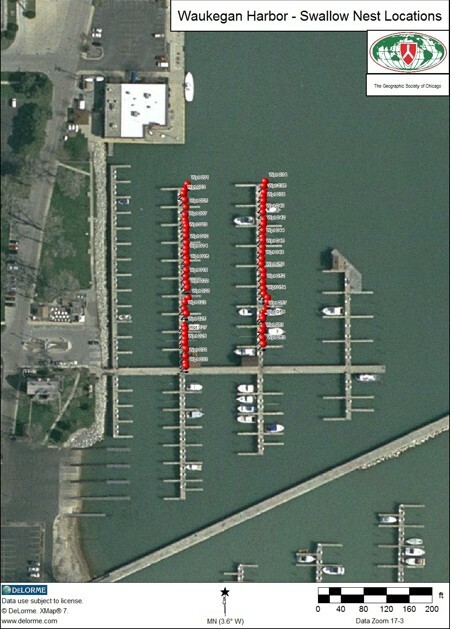 A set of boat docks lies over one of the most contaminated areas of sediment. 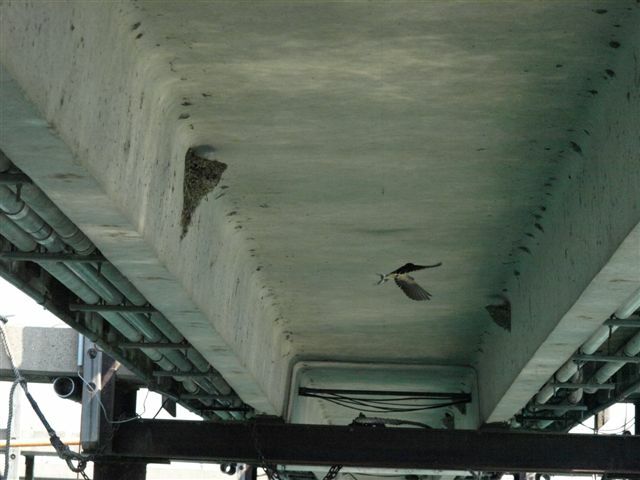 While contractors prepared to demolish the docks in order to get at the contaminated sediment below, a colony of nesting swallows was found that favors this location. CAG and their numerous partners were requested to help. A data collection expedition was rapidly assembled. 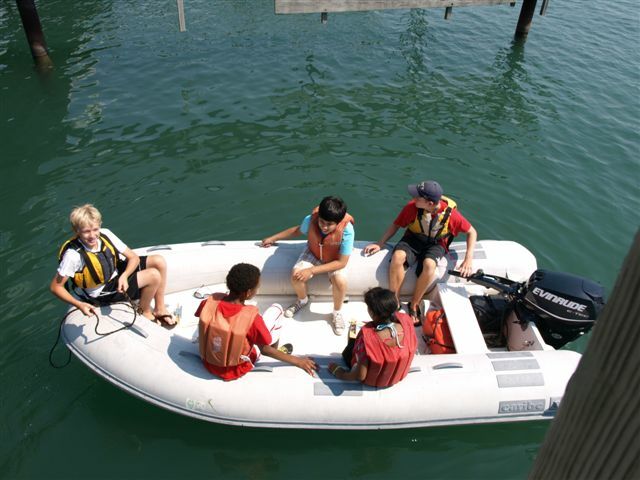 The Waukegan Harbor Jr. Fleet and a crew of 8th – 10th grade students provided a motorized raft. Students from the CSE were enlisted to collect the GPS coordinates of the active nests. None of us from the GSC could assist in this mapping effort on the scheduled date. Instead, CSE students used their recent experience with GPS and GIS technology to collect data on their own. Applying their newly-acquired GPS operating skills, 7th and 8th graders from CSE successfully recorded 63 nest locations. The file was sent to the GSC and a map of the data was returned within hours. The map was forwarded to USEPA, dredging contractors, USF&W, USGS and the IDNR. Together with results from contractor studies, the dock demolition schedule was modified to allow the swallow chicks to fledge and leave the nest colony. The swallows were saved, the dock was demolished, sediment dredging began on schedule, and the power of geospatial technology to inspire elementary school students was demonstrated.